This is a companion calendar to the 2014 Kentucky Summer Bucket List. See the Bucket List HERE. Please double check all dates/times before you make arrangements to attend an event. Venues may change their plans, and their changes may not be reflected below. 5-8	Great American Brass Band Festival, Danville. Includes the Great American Balloon Race, June 6, 5:30-7pm. Free. Great American Creation Station for kids, June 6, 12-5pm, Free. Concerts and picnics throughout the weekend. 15	Creek Stomping, Big Bone Lick State Historic Site. Free. 12n - 2:30pm. For families. 21-22	Fort Harrod Settlement and Raid, full scale re-enactment. Huge event. 6	Creek Stomping, Big Bone Lick State Historic Site. Free. 12n - 2:30pm. For families. 18-19	Twin Lakes National Fiddler Championship & Freedom Festival, Leitchfield, KY. Fireworks, all ages fiddler championship, free carnival rides. Free. This List just skims the surface of what there is to do in this incredibly interesting state that is full of natural beauty and rich culture and history. It will not include everything on the previous bucket lists: 2012, 2013, so check those out if you want even more ideas. This List focuses on the Bluegrass region of Kentucky, but it also includes several things to do in other Kentucky regions as well as Cincinnati. *Children are often significantly discounted or free. Ask for government, military, veteran, first responder or teacher discounts. This key does not guarantee that prices or dates won't change at these venues. This is only a guide; please check each venue for updated information. When you are done perusing the Bucket List, check out the companion post: the Kentucky Summer Bucket List Calendar of Events. Summer Movie Express, Regal Cinemas, $1 movies on Tuesdays and Wednesdays at 10am, starting June 3. Summer Movie Clubhouse at Cinemark, $1 movie or $5 for 10 movies, Thursdays and Fridays at 10am, starting June 11. $1 off snack coupon on website. Summer Kids Flicks at AmStar Theaters, Tuesdaya and Wednesdays at 10am starting June 4. $3.50 includes movie, popcorn and drink. Theaters of Georgetown, FREE movies, Wednesdays and Thursdays starting June 5. Walk around Lexington Cemetery. Bring your camera for beautiful pictures. Stop by the Visitors Center for a Kids Scavenger Hunt guide. Free. Ride, walk or jog on The Legacy Trail. Free. Discover the trees and plants of Kentucky by taking a walk at the Kentucky Arboretum. Free. Ride the Rails at the Bluegrass Railroad Museum. The prices are really reasonable and include an interesting museum inside. Check out the family membership if you plan to go more than once. Look at the Foucault Pendulum and the World’s Largest Ceiling Clock at the Lexington Public Central Library, and don’t forget to go to the Book Cellar in the basement! Free. Go birding, look at the "blue hole" aquifer, and stomp the creek at McConnell Springs. Their upcoming summer events look fantastic. Free to walk and explore. Some events have a minimal fee. Get a workout with the Jacobson Park Paddle Boats - $4 for 30 minutes. Fish, go birding, play at their amazing playground. Several geocaches here too! Take a hike at Raven Run Nature Sanctuary. If you have young children, make sure to ask a park employee which hike is more "child-friendly"! Free. Floracliff Nature Sanctuary (not open to the public, but open for reserved tours for groups up to 15 ppl). Their $5 workshops are highly recommended. Dupree Nature Preserve, Lancaster (Kentucky’s newest nature preserve!). They are developing several family-friendly activities and trails. Free. Perryville Battlefield State Historic Site, Perryville. Cumberland Falls State Park. Check the Park calendar and catch the moonbow at Cumberland Falls - it's magical! Red River Gorge, 50th Anniversary celebrations all year. An absolutely breathtaking part of Kentucky, RRG is great for hiking, climbing and camping. Natural Bridge State Resort Park, Slade. Free - $$. There are multiple trails for all skill levels. Take a picnic, hike a trail and ride the skylift. It's beautiful! Federal Hill (aka My Old Kentucky Home), Bardstown. If in season, try to catch a showing of the musical based on Stephen Foster's life. If there is one thing you must do this summer, it is Visit a National Park! If you have children, the Junior Ranger Program is one of the very best introductions to the history and natural resources of a park. The Junior Ranger program offers children ~5 and older an opportunity to fill out a short book of age-appropriate activities and earn a "Junior Ranger Badge" for that park. Our kids have loved becoming JRs at each National Park we visit. They collect stamps in their NPS Passport and trade cards with Park Rangers. I cannot recommend this program highly enough! Cincinnati Zoo. $$$ (if you are an educator, register for educator discounts). This is a GREAT zoo. John James Audubon Museum and Campground, Henderson. State Park fees apply. Kentucky Bucket List Summer Calendar! In June of 2012, my three children spent a week with their grandparents in North Carolina. On the way, they stopped at a rest stop and found a female Polyphemus moth on the ground near the vending machines. Fearing that strange feet might crush her, they put her in the bug cage they carried (in case of emergencies like these, of course) and took her to the grands' house. On the journey, she laid approximately 120 eggs. When they returned to Kentucky with the eggs, we did some quick research before 30 tiny caterpillars emerged. Almost one year, four states (we took those caterpillars everywhere) and 18 cocoons later, we have about 800 caterpillar eggs that we are giving away to local children to raise. This has been a wonderful experiment and experience, one that every child would be blessed to have. Attached below is a care guide that the children wrote to help their friends raise Polyphemus caterpillars to adulthood, or "mothhood"? The story and the instructions are almost entirely theirs. I did point out a few things they missed and put in a few technical details and photos to help parents help their children. Otherwise, I consider this a pretty decent end-of-year science project! Spend a day at Serenity Hill Farm in Nicholasville, home to a small flock of Romney sheep. Watch the sheep shearing, card the wool and buy a skein of yarn! Day trip to the John James Audubon State Park in Henderson, KY.
Find and take a picture of a covered bridge in Kentucky (free). Here is a link to a nearby covered bridge, the Switzer covered bridge near Frankfort. Here is another covered bridge in Paris (Bourbon County), the Colville Covered Bridge. Sign the kids up for a summer of free bowling! See William Shakespeare's "As You Like It" on stage at Josephine Sculpture Park in Frankfort. Performances are June 7-9 and 13-15 at 7pm. Day trip to Frasier History Museum in Louisville, one of the best living history museums in the United States. Attend the awesome Great American Brass Band Festival in Danville, June 7-9. Got anything to add? Tell us about it in the comments! As many of my friends are going to the Great Homeschool or Teach Them Diligently conventions in the near future, may I offer this bit of advice? Please try to avoid making any quick decisions on curriculum after having attended a compelling session at the convention. Let me share two reasons. 1. Two years ago, I went to the Greenville GHC and heard a particularly exciting presentation from a popular language arts curriculum writer. Afterward, I and many others went into the vendor hall and visited her booth. There she was selling her products at full price. The day before, I had received an email from the Homeschool Buyer's Co-op offering the same products at their 40% group buy discount. I asked her about it, and she said that all products at the convention were full price and that they were not advertising the deal with the HBC to convention attendees. Many single-income homeschooling families paid hundreds of dollars for the curriculum that could have been 40% off. 2. 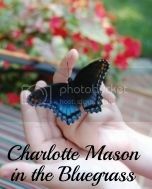 Another curriculum that purports to be a "Charlotte Mason" curriculum is currently offering several books on their website that are in the public domain, which means they are out of copyright and are FREE on your Kindle or e-reader. You can download them at Amazon, mainlesson, Google books, etc. Now, lots of publishers, including Dover and Yesterday's Classics, reprint public domain books for a very modest price (as in $5-$6), and I've bought several because sometimes I want a "real" book! However, this website is offering books by Jean-Henri Fabre for $20-$25. They are offering a geography book by Charlotte Mason (!) for $17. They are offering a book by Margaret Gatty for $35, though the sample from this one contains added Q&A worksheets and written reports at the end with no mention of oral narration (worksheets and written narrations before 10 yo are not part of the Mason model). Go with a plan. Look at the speakers ahead of time, research them online, and go to the ones you think will help you with the children you are currently schooling. Buying curriculum that you think could be used multiple times is tricky, as your next child's learning style could be completely different. Have a shopping focus. Go with a list of things you know you can get cheaper at the convention (also consider there is no shipping cost). Don't get sucked into a sales pitch. You can often get a vendor to give you a conference offer that lasts through the Monday so you can go home and research. Buy only what is on your list and have a budget limit for "extras" you can buy, such as a fun game or puzzle for your kids. In my previous post, I described why I believe children benefit from a study of architecture. In our school, we use a living book written by Virgil Hillyer, former Headmaster of the Calvert School in Baltimore, Maryland. Hillyer co-wrote this book with Edward Huey, an art and science teacher at Calvert who had a particular interest in sharing oft-neglected works of art, sculpture and architecture with his students. Together, they spent seven years writing three books to introduce children to these subjects. We use the book pictured above, A Child's History of Art: Architecture. It can be found for a reasonable price at new or used booksellers online. Beginning with the pyramids of the ancient Egyptians, the authors bring to life the people and cultures that gave rise to the greatest civilizations on earth. We learn about ziggurats like the Tower of Babel, obelisks such as Cleopatra's Needle and the Washington Monument, the Greek Parthenon, Alexander's Lighthouse, and Roman arches and aqueducts. Children are introduced to a plumb line, a level and a carpenter's square. They learn the difference between a "capitol" and a "capital." Have you ever wondered what is the difference between a Doric, an Ionic, and a Corinthian column? Your children (and you!) will be able to identify them out the car window once you read this book! Each week, we read approximately half of one chapter. We are usually able to complete the reading in one day, sometimes two if there are many new terms to introduce (as was the case with cathedral architecture). There are 29 chapters, which translates into spending 12 to 18 months with this book. If this sounds like a long time, it is and should be. We have over 5,000 years of architecture to cover! Spending time with the people and places and buildings in this book ensures we appreciate them in their context and do not rush through what they have to teach us. After reading through the passage one time, the children narrate the reading. (If you are unfamiliar with narration, please read this page.) Since there is more than one child in our school, each child narrates in turn without repeating information previously shared. Occasionally, we narrate through drawing instead of verbal narration. An example of this may be drawing Gothic and Roman arches and comparing/contrasting the two. After the reading and narration are complete, we look at the black/white pictures in the book. However, the internet is a treasure trove of pictures and additional contextual information. For example, enter the search term obelisk, and one will see hundreds of wonderful examples. Or, you could visit your local cemetery, where it is almost certain you will see an obelisk memorial. If we have time, we use Google Earth to virtually visit Notre Dame in Paris or Il Duomo in Florence, Italy. Approximately every other week, we update the timeline on our wall. If we have studied a particularly famous building (e.g. White House) or period of architecture (e.g. Baroque), we may paste a picture of the building or an example of the time period on the timeline. Outside of the classroom, we visit local buildings that are examples of the architecture that we are studying. See below for several Kentucky architectural landmarks. As we plan trips, if there is an architectural landmark on the way, we make an effort to visit. Last year when we visited family in Nashville, we took a few hours to visit the Parthenon. This may be the closest we ever get to visiting Ancient Greece! As we drive around town, even around neighborhoods, we encourage the children to spot architectural elements. When we drive down Tates Creek Road to downtown Lexington, we pass four different types of architecture: English Tudor, Gothic, Richardson Romanesque and Georgian Colonial. The kids have made a game of it now: "Mom! Gothic arch to the left! Georgian fanlight to the right!" An excellent example of Gothic architecture, the basilica has the largest rose window in North America and what is thought to be the largest stained glass window in the world. Built in 1814, the Federal style Hunt-Morgan House has many beautiful architectural features, including the Palladian window with fan and sidelights that grace its front façade. In 1955, the Blue Grass Trust for Historic Preservation was formed to save the home from impending demolition. The organization restored the home to its Federal appearance and now operates the house as a museum. This courthouse is an example of Richardsonian Romanesque architecture. Home to the Lexington History Museum, the courthouse is currently closed for renovation. However, one is able to walk all around the structure and appreciate the architectural details of the exterior. See pictures below of our visit to the Courthouse Plaza. Quite a lot of history here too! Did you know Kentucky has her own Lincoln Memorial less than a two hour drive from Lexington? It is a wonderful example of neo-classical architecture, including doric columns, cornices, dentil molding and fluting. The cornerstone for the memorial was laid on February 12, 1909, 100 years after Lincoln's birth. The monument was dedicated in 1911 by President Wm. Howard Taft. A plaque on the wall names the Board of Trustees of the Lincoln Farm Association, who were tasked with raising private money for the building. Perhaps more well-known that the first listed trustee, President Taft, is the eighth listed trustee, a man named Samuel Clemens. Why Should a Child Study Architecture? When we began homeschooling four years ago, it never crossed my mind that architecture would be a component of our study, and it certainly didn't occur to me that we would find it to be one of the most enjoyable and rewarding parts of our education. We were introduced to Virgil Hillyer by a friend at Childlight USA. We had started to read Hillyer's Child's History of the World, and she suggested that his three small books on architecture, sculpture and painting would be a wonderful supplement to our studies. Hillyer was the Headmaster at Calvert School in Baltimore. A teacher at heart, he was the author of many child's histories. He co-wrote the series on art with one of the science and art teachers at Calvert School, Edward Huey. They worked together for seven years on the series, bringing to a child's attention the oft neglected works of fine art, sculpture and architecture. After four years of observing the fruit of architecture study, I believe that it should be a part of every child's education because it also helps the child develop a fuller appreciation for all other subjects. When a child has studied architecture, he is unafraid of the Pythagorean theorem because he has seen it before in Egypt's Great Pyramids and the Louvre Pyramid in Paris. In his U.S. History class, he can understand how a young John Quincy Adams could eavesdrop on fellow House members as they met in Statuary Hall because of the Hall's elliptical ceiling. When he reads Pyle's King Arthur and His Knights, he knows that a portcullis is the huge latticework gate that is dropped across the gateway of a castle to bar intruders. He can visualize the Globe theater of Shakespeare's day because he knows that Tudor architecture was popular during Queen Elizabeth's reign. After building a good foundation in architecture (pardon the pun), children take delight in pointing out architectural terms in the books that they read. They love to discover that their house has dentil molding, casement windows, a fanlight, or arches and keys above their windows. They begin to look for elements of architecture in the neighborhood and cities they visit. By including a study of architecture in our schools, we are creating well-rounded citizens. We are not only exposing our children to the standard "reading, writing and arithmetic," but encouraging a child to become "a master of much knowledge besides." "Possessed of a divine and marvellous intellect and being an excellent geometrician, he not only worked at sculpture . . . but also prepared many architectural plans and buildings . . . he made designs for mills and other engines to go by water; and, as painting was to be his profession . . . he studied drawing from life." Leonardo knew nothing about Art for Art's sake, that shibboleth of yesterday, nor did our own Christopher Wren, also a great mathematician and master of much and various knowledge, to whom architecture was rather a by-the-way interest, and yet he built St. Paul's. What an irreparable loss we had when that plan of his for a beautiful and spacious London was flung aside because it would cost too much to carry it out! Just so of our parsimony do we fling aside the minds of the children of our country, also capable of being wrought into pleasaunces of delight, structures of utility and beauty, at a pitifully trifling cost. It is well we should recognise that the business of education is with us all our lives, that we must always go on increasing our knowledge. Let us re-read one particular sentence. All that he knew was part of his daily thought and enjoyment. How beautiful would it be to have children who daily meditate and take joy in the knowledge they are acquiring! Creating this sense of joy and passion for learning is exactly what we as teachers aspire to do. A feast of living books on a variety of subjects give us the best opportunity of accomplishing just that. I hope you that you will consider adding a study of architecture to your homeschool routine. In my next post, I will provide a suggested schedule and method for studying architecture. In our homeschool, the year is divided into 3 terms of 12 weeks each. At the end of each term, we have an examination week, a week devoted to discovering the relationships our children have made to the events, people, places, characters and stories that we've studied that term. It is an exciting time for me as their teacher, because I am always surprised by the connections they have made in their minds in the course of the 12 weeks. Instead of my creating tests and picking and choosing the questions and "right" answers, exams (in a CM education) give the child the opportunity to tell everything she knows. What child does not delight in telling back what she has learned? Often we find she has learned much more than we thought she could have remembered, and she has often connected previous terms' stories or experiences with what she has learned this term and delights in "connecting the dots." Here are some examples of the Term 1 exam questions and answers for our Year 5/6 student. By the way, "5/6" means that half of her curriculum is considered at the 5th grade level and half is at the 6th grade level. She is 11 years old. Please note that these exam answers represent her exact answers - grammar errors, misspellings, punctuation errors included. I do not correct exams for these errors because that is not the point of the exam. I do make note of the type and nature of the errors so that we can work on correcting them in the next term. Question: Tell me about Claude Debussy and the piece "Clair de Lune." Claude had a gift at a very young age so his father and mother sent him to music school. Claude would enter a contest every year at school. It was a contest that whoever won got to go and study at Rome. Claude when he was 22 won the contest and went to Rome. Claude had to send a piece that he wrote every year to check his progress. The people at his old school said that his pieces were too vague. Claude still sent back more, including Clair De Lune. Claude's piece Clair De Lune was a very nice piece, and it still is. Clair De Lune is a peaceful song. It is like laying down looking at the stars and seeing how beautiful they are. My family once went to the park, we took a quilt. We looked at the stars while we acually listened to Clair De Lune! This piece is beautiful and magnifacent. Everyone would love it. Question: Of the styles of architecture we've studied this term, which one is your favorite: Islamic, Italian Renaissance, English Tudor, French Renaissance, Baroque, English Renaissance, Early American Gothic or Georgian/Colonial? Describe why it is your favorite and give some examples of the architecture or the person(s) who introduced/influenced this style. Out of all the architecture we studied, I think that English Tudor was my favorite. English Tudor is named after the Tudor family which was the line up to Queen Elizabeth. This architecture has horizontal and vertical lines. The materials used in this architecture are plaster and wood. A little girl once called Tudor architecture a zebra house because of the stripes. People even today use this architecture as a modern cozy home. You can even spot one where I live in downtown Lexington, Kentucky. Question: Choose one of the following poems and tell how Henry Wadsworth Longfellow's life story impacted its writing: "The Wreck of the Hesperus," "The Psalm of Life," "Shakespeare," or "A Rainy Day." I think that "A Rainy Day" reflects Henry Wadsworth's past the best. The rainy day is about a dreary day, and I can understand how the poem reflects him. Henry's life was not like a super man's life. It was dreary and dark. Henry's first wife died after childbirth, and Henry was not happy. Henry now married another woman, but one day while she was putting wax on a note her dress caught on fire. Henry rushed in to put out the fire but was to late. Henry's wife soon died of fatel burns. Henry to was burned on the face so badly he had to grow a beard. The rainy day is a great example of his life at that point and how terrible it must have been. Question: Tell about Saint Patrick and his lasting impact on Ireland and her people. What did Ptolemy discover and Copernicus elaborate on that disproved Aristotle's statement that the earth was the center of the universe? Aristotle had the theory that the sun along with the other planets rotated around the earth. Of course today we know this is not true. Back then though people believed Aristotle, but still some said differently. The Copernicus theory said that the earth along with the other planets rotated around the sun. Aristotle said though that the earth is too heavy because it is bigger than the other planets. He said that the earth could not be rotating when it is to heavy. If we were rotating, we would be falling and spinning. Copernicus asked, "How could the sun cast a shadow on the moon if the sun was rotating with the moon? But if the moon was rotating with the earth, the sun could cast a shadow!" Copernicus thought that the sun's shadow was why the moon waxed and waned. This is why Copernicus thought the sun was the center of the universe. My Year 5/6 student also took exams in Math, Literature, Art, Geography, Science: Anatomy, Bible, World History, European History and Greek Mythology. I have not posted all of those exams, but if you would like to read the questions/answers, let me know, and I will post them. Schooling multiple ages has come up more than once during our Charlotte Mason Study Group discussions. I have only 2 of school age (and one who likes to play at school occasionally). How do you get everything done in a day when you are teaching one to read and the others need your time as well? My first piece of advice is to get your oldest student(s) to a level of independence that allows you to spend more of your morning time with your younger students. I think we can all agree that students, especially younger students, are freshest and most eager in the morning! So, my Year 6 student (my daughter) spends most of the morning independently working on copy work, reading, math, history, poetry, etc. If she gets "stuck" on any of her subjects, she makes a note to discuss with Mom and then moves on to the next subject. This allows me to spend most of my time in the morning with my Year 2 student (my middle son), who is still learning basic math concepts, how to improve his penmanship, how to spell using his phonetic toolkit, and how to read at a higher level. When my son has free time, I work with my daughter on those subjects where she needs help or on the subjects that are designated "together" subjects, such as Plutarch or Shakespeare. When little brother is asleep in the early afternoon, we do our "together" subjects that benefit from the added peace and quiet. Do not hesitate to institute a daily quiet time of up to 2 hours. We need it, and children do too! My second piece of advice is to utilize your older student(s) to teach your younger student(s) as soon as possible. This is a great opportunity to develop sibling relationships and a sense of responsibility and maturity in your older students. We often marvel at what Laura Ingalls (Wilder) was expected to do at the age of 10, and then we look at our children and wonder why they are less able. Well, they aren't! They are perfectly capable if we give them a standard to which to aspire! Why not allow your older student to practice math facts with your younger? How about an older student reading to or putting together a puzzle with a preschooler? Do you ask your older student to prepare the snack for everyone, or even lunch or dinner, so that you are able to spend more time with your younger students? Preparing snacks and meals is very much a part of home economics (i.e. school)! While it is easier to school multiple ages in the same text at the same time, it is not always the best thing for the child. Some books lend themselves to different reading levels. The Bible is a good example because regardless of a child's age, he/she is able to take away truths that are appropriate to their comprehension level. This is not necessarily so with a history or literature text. For example, my Y2 student has thoroughly enjoyed D'Aulaire's Book of Greek Myths. My Y6 student is reading Bulfinch's Age of Fable (another book of Greek myths). However D'Aulaire's book is written at a more basic level, while Age of Fable has more complex situations, vocabulary, phrasing, etc. They are studying the same topic, even the same characters and stories, but my Y6 student should be reading independently - at a higher level - than my Y2 student. Please keep in mind that this is purely my opinion, and every home is different, so you should do what works for your students! You know your children best. The list above comes from my experience and my talking with many other families who utilize the CM method. The only reason I post it here is because I've been asked about it so many times that I thought I should just record my comments for posterity! If you have additional thoughts on teaching multiple ages, please comment! After creating a weekly guide for our school day, it was necessary to create a more detailed daily lesson plan - one that my Year 6 student could follow independently. The check boxes help me see at a glance what needs to be done to finish out our week (and therefore our term) on schedule, and she is allowed some liberty to change her readings and narrations to different days, depending on our schedule. For instance, if little brother has a particularly long nap time, she may choose to complete more than the assigned written narrations in a day, because they are easier to do when there is peace and quiet! She can do her oral narrations in the car or while making dinner together, so as long as she is finished with her assigned readings by the end of the week, she earns the flexibility to change her daily readings. This does not apply to any subjects we do together with her Y2 brother. Yellow highlighting represents subjects she does independently. Blue highlighting represents subjects we do together (she and I) or subjects we do with Y2 brother. Days that are "white" or not highlighted are days when she doesn't have that subject. The two columns after the subject name are how much time she spends on that subject (approximately) and if she does it Independently or Together. I do try to give her the same approximate time "in school" every day, so I try to stagger the longer subjects that are not daily subjects. I fill in the template in pencil so I can note that day we were in school. If we go on a field trip, I note that at the bottom (under "Other"), and we have the option to count that day as a school day. I put the total number of school days on the blank row above the Days. If I had a scanner, I'd just scan a sample page and show you! I fill in each week in pencil, and this works really well because she or I can move things around or write notes about a particular thing that happened that day. I put her list of books at the bottom and give them acronyms. I print out 12 sheets for 12 weeks (which is one term for us). I will insert the acronyms on the days that I would suggest she read or complete that particular subject. Some are the same across the week (foreign language, folk song). Some change daily, e.g. Bible, where we complete the Calvary Chapel (CC) curriculum on MWF and work on memorizing a book of the Bible (Ephesians) on TTH. Poetry: We read and discuss a new poem e/o week. This is because she is reading much longer poems by Longfellow, and they take more than one week to get through. Composer Study: We alternate composer and artist study e/o week. I write in the name of the piece of music or art we are doing that week. Nature Study: I write in whatever we happened to have studied that week, depending on the season. Shakespeare: AYLI, then I write in how much we completed that week. Handicraft: I write in what we accomplished in crafts that week, though lately it's not been one craft but a variety! Psl Development: I write in what habit or character trait we've discussed that week. Family Readalound: We enter the name of the book we are reading at the time. Other: Here I note her additional reading (H) or a co-op she's doing or a field trip we've taken or a particular activity that I consider school related. How do you tell her how much she is to read in a particular book per week? Great question, and I'm happy to say that this is mostly done for you on the AO website. The AO Year provides a weekly reading schedule, and I just copy it from there into a table and print out that table. For Week 2, if she is to read Story of Inventions, she looks at the SOI table and sees that she is to read pgs. 11-24 that week. Pretty simple. Feel free to ask questions in the comments. I am positive I've forgotten to mention something! Wife to a good man, parent and teacher to 3 children, facilitator of CM Community in the Bluegrass region of Kentucky.